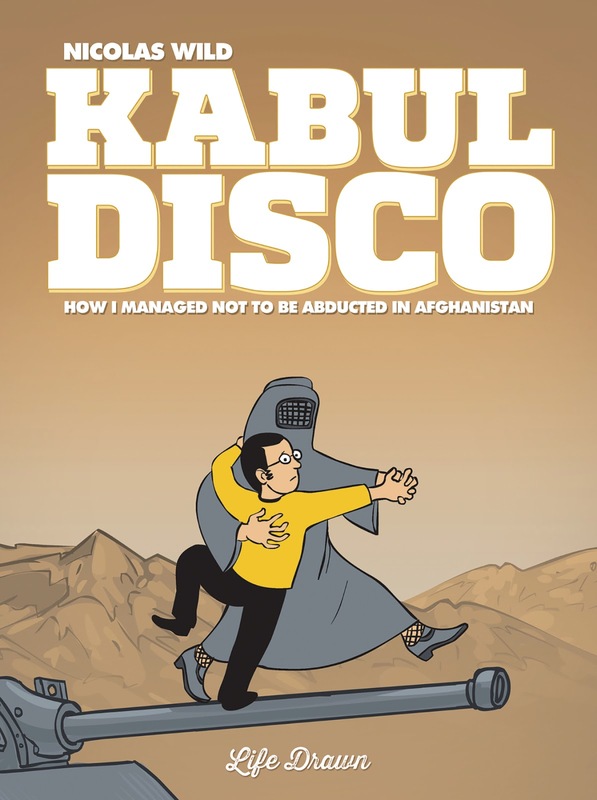 Created, written and drawn by French cartoonist, Nicolas Wild, Kabul Disco offers an interesting, humor-laced story detailing his experiences as an expat artist living and creating political comics in Afghanistan. Originally written and released in French in 2009, the book has been translated into English and released by Life Drawn on April 4, 2018. Life Drawn is a new imprint of Humanoids inc., focusing on real life, personal stories as opposed to science fiction and fantasy alone. Kabul Disco begins with Nicolas still in France, a struggling young adult looking for work while in a living and housing situation that is far from convenient. When he receives an email about an available job in Kabul, Afghanistan as an artist for an adaptation of the Afghan constitution to be utilized as teaching aids in Afghani schools, he saw it as a way out of his current situation and jumped at the chance. The remainder of the story details the next four months of his life in Kabul. It might be hard to imagine that there is enough interesting reading material to fill up an entire 160 page graphic novel with a timeline of only 4 months, but Wild has painted a story that is inspiring, engaging and offers a perspective that I think many, especially those of us in the United States, would be interested in hearing about. The story is set in early 2005, which many Americans will remember was shortly after George W. Bush was reelected as President, an election that will go down in history for how close the numbers were and the fact that it was a single phone call responsible for the vote calling which handed Bush the lead over Gore. Hearing the perspective of an outsider was incredibly interesting, especially on an event that for me, had been somewhat forgotten. As an American, I of course have many opinions of my own when it comes to Bush and that election, but being able to read about how someone from another country saw it, from an outsider looking in, it was really captivating. Wild does an excellent job of expressing his honest, poignant opinion without necessarily beating you over the head with it, which I think will cause people from all viewpoints to really be able to appreciate this book. That being said, I think seeing the cultural and political climate of Afghanistan during that time period being explored in such a way was my favorite part of this book. Getting an insider’s perspective of the state of the country in the early 2000’s from someone other than a soldier offers a viewpoint that I think would really be hard to find elsewhere. You are able to see the good, the bad, the frightening and the downright ugly parts of what it was to live in that location as an expat as well as a small glimpse into the lives of those who had lived there their entire lives. Being able to showcase life in a war torn country without painting it in utter negativity is something that Nicolas Wild has done extremely well in Kabul Disco. Sarcasm and humor break up the more serious aspects of the tale, leaving you with a story that is heartfelt, smart and thought provoking. Nicolas Wild’s art undeniably showcases his style and talent as a cartoonist. His style is certainly humorous and cartoony with a penchant for occasional lifelike scenery pages as well. The cartoon style that is used in Kabul Disco melds well with his writing, showing how wonderful a book can be when both the art and writing is done by the same person. There is a level of cohesiveness that definitely is what this particular book requires, in my opinion. Even though the art is clearly done in a highly animated style, you will still notice the level of detail and thought that has gone into making every character unique. These characters are people that Wild learned to know well, in settings that became his home and the homage he pays to them via his art is fantastic. I found Kabul Disco to be a surprisingly refreshing, unique read. If you are looking for a graphic novel that is interesting, thought provoking and one in which you will be able to learn about other customs, lives and cultures this one is definitely for you. A vast difference from the usual superhero, horror or fantasy comic that I normally am accustomed to reading, I found this book to be extremely compelling. Seeing a world that I may never get to see firsthand, through the eyes of someone else was such an enjoyable experience and I would highly recommend this book to others looking for the same.